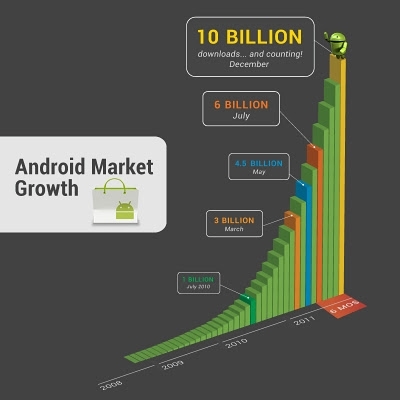 Android Market reaches 10 Billion downloads | Android Blast! The Android Market reached an important milestone over the weekend. Over 10 Billion apps have now been downloaded from the Market. The growth rate for the Market is one billion app downloads per month. To celebrate this milestone, the Market will offer 10 new apps each day for the next 10 days that will sell of $.10. Yep, that's 10 cents. That's a real deal, so head on over to the Android Market to pick out your apps.